Product prices and availability are accurate as of 2019-04-18 03:56:44 UTC and are subject to change. Any price and availability information displayed on http://www.amazon.com/ at the time of purchase will apply to the purchase of this product. - Is soft enough to bend and tie into knots but stiff enough to handle with hands and easy to straighten. It can be used to make or restore jewelry such as necklaces, lariat chokers, bracelets, wristbands, earrings, or even Kumihimo styled woven jewelry. It is great for making garments, shoe laces, boot strings, lanyards, key chains, hatbands, headbands, or even cat teasers. Though most people appreciate the smell of real leather, some might find it unpleasant. The smell will get less and less strong after being exposed to air. Genuine leather has reasonable tension but it is not as strong as faux leather. 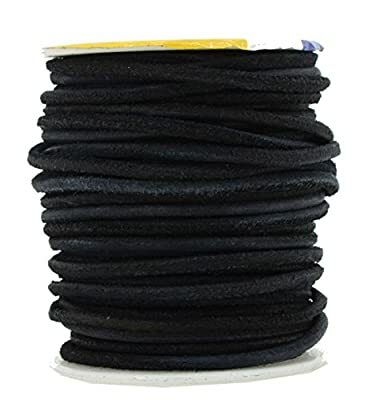 The suede cord is suitable for non heavy projects. Mandala Crafts is located in Austin, TX. We have been making quality jewelry accessories for more than 15 years. All our products are made with care and professionalism. Every roll is marked with the Mandala Crafts brand label. Mandala Crafts is a registered brand with the US Patent and Trademark Office. Mandala Crafts is the only seller of this brand. We offer a 30-day no questions asked money back warranty. GENUINE ROUND SUEDE LEATHER ROLL - Made from cowhide leather; Rustic, soft and pliable; CONTINUOUS LONG LEATHER SUEDE STRING- 20 Yards (18.28 M); Manufacturer Direct Lowest price per yard CONSISTENT RUGGED WORN COLOR - Well applied dye; FLEXIBLE AND VERSATILE -- Great for leather jewelry making, lacing, sewing, braiding, or crafting WARRANTY- Mandala Crafts® offers a 30-day no questions asked warranty.